It's the last day of August and the 5th Thursday! 4CC #366 Anything Goes/Crazy Egg Challenge ! Yes, that means go crazy and create anything your heart desires! 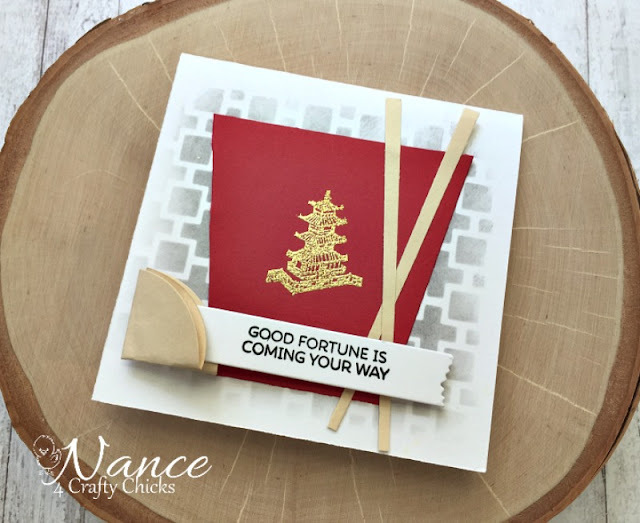 I used the Good Fortune stamp set by My Favorite Things and the stencil is Heidi Swapp. I cased a card by one of the MFT designers. I don't have the dies so I found a fortune cookie tutorial and just trimmed chopsticks from paper, tapering them down on one end. Stop by the Hen House and check out the rest of the Chicks' projects, and give Lyn a HUGE THANK YOU for being such an awesome Guest Designer this month. Today is her last day with us. Then don't forget to link up your own ATG project to share with us. You might be a Golden Egg winner! Love your fortune cookie, chopsticks and tax guy! Fabulous idea and inspirational hit. This is cool, great idea, love the embossing, way to go! Paper Sweeties August Release Rewind! Paper Sweeties August Release Party! Paper Sweeties August Release Sneak Peeks!